Thick and strong glue for high-stress areas. Ideal for laminating and forming fillets. 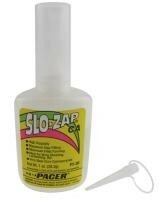 Due to the time it takes to produce the Slo-Zap CA 1 oz. Glue ball it will ship in immediately. We cannot ship this ball outside the United States.